Hello everyone! Sorry I've been absent for a while; it's been a bit hectic with work and house stuff. But I'm back now, and am returning to an old favourite post of mine: red carpet fashion. Last night was the BAFTAs and there were plenty of beautiful dresses on show to love. Here are my favourites - were any of these on your list? Cate Blanchett always pulls it out of the bag and this McQueen number is no exception. I love how the opulet embroidery makes it feel really luxurious but the sleek shape really flatters her figure. Keeping her hair and makeup simple allows the dress to do all the talking. Say what you like about Kate Winslet, but she knows what works for her and sticks to it. The dark colour of the dress contrasts her pale skin and hair, and I really like the unusual neckline. Adding flashes of red in her lipstick and bag stops it all from looking too plain. You can't go wrong with black and white on a red carpet, and Tanya's dress is just a perfect example of a beautifully classic dress. The simple shape and colour-blocking work really well together, and her classic waves and red lipstick bring an old Hollywood look right up to date. Block colours were a common sight on the BAFTAs red carpet, but Angela Bassett was one of few stars to opt for something other than black or red - and she looked amazing in it. I love the hot pink colour and the fact that everything else is kept really simple to show off the daring low back. This was on a lot of worst dressed lists but I actually really love it. It's bright, it's colourful and it's young - all things that an actor of Bel's age should be. The spaghetti straps give a nod to the 90s trends currently sweeping the catwalks and again keeping the hair and make-up simple means the dress is able to fully shine. Appropriately for an actress who made her name in a sci-fi series, this oozes space-age glamour. The sleek shape stops it from being too much and I love how the sparkle catches the light. Paired with those beautiful flowing waves and the simple black clutch, it all adds up to a stellar combination (see what I did there?). At the risk of this sounding like a backhanded compliment, I don't often like Julianne Moore's dresses on red carpets; there's always something about them that's not quite right. This, however, is perfect. The shape is really flattering and the colour really suits her, whilst the swept-up hair evokes Audrey Hepburn in Breakfast at Tifanny's. I love it. 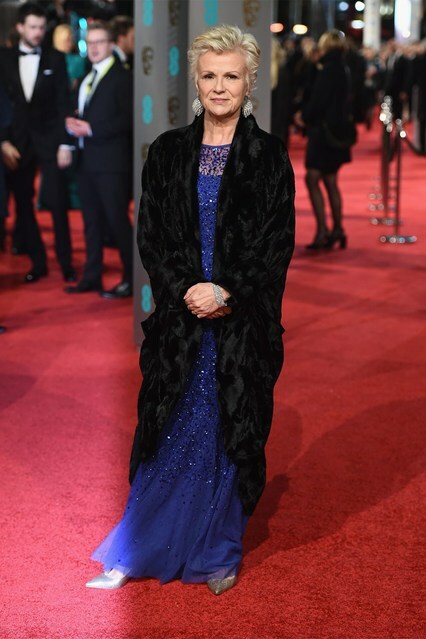 This year it was Julie Walters doing it for the glamorous older actresses, and she looks absolutely awesome in this bright blue dress - it really works for her skin tone. I love her layering up with a luxurious faux fur coat (well it was freezing cold) as well, managing to look comfortable as well as stunning. Thank you! She always looks lovely but I thought this outfit was particularly gorgeous.